After reaching that glorious stage in life when other people couldn't make me do things I'd rather not, the case against exercising seemed straightforward and overwhelmingly persuasive. Therefore, by exercising, less time was available for programming. I'm a hacker—I like to program! Substitute your own favourite activity for programming and you'll see what I mean. In addition, exercise carried all the unpleasant connotations of high school calisthenics, or the equivalent indignity of more modern, yet equally regimented, forms of workouts. But is there a flaw in this argument after all? Indeed there is. The premises are correct, but the conclusion doesn't account for the fact that regular exercise will, in all likelihood, allow you to live longer. Let's look at the numbers. 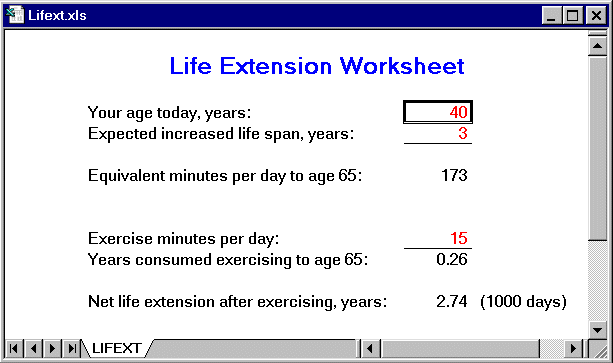 This “Life Extension Worksheet” is provided as an Excel worksheet. You may want to load LIFEXT.XLS and plug in your own numbers to compare with mine. Directions for calculating increased lifespan by hand are given in the Pencil and Paper chapter. So, if you're 40 years old, and you exercise 15 minutes a day from now until you turn 65, you'll have spent a total of about a quarter of a year exercising in those 25 years. But, if by exercising you manage to live 3 years longer, you're ahead by a total of two and three quarters years by age 65—1000 days. Your increased life span works out to an additional 172 minutes per day from age 40 through 65. Even after spending 15 minutes exercising, the life extension you can expect from getting into shape gives you what amounts to two and half more hours per day to do whatever you enjoy most! Even if you live only one additional year through physical fitness, you'll still end up with 270 more days by exercising. Of course, we're talking percentages here; you could be run over by a truck tomorrow. But hey, if you're in shape you may dodge that truck! If you don't buy the “feeling better” argument, consider this. Virtually all medical evidence shows that if you don't exercise, you're more likely to suffer a heart attack or, if you're going to have one anyway, to have it earlier in life. Even if you're resolute in believing you won't feel one whit better from exercising, you'll certainly concede that you'll feel a whole lot worse after collapsing to the floor with a coronary. I've no direct experience with this particular unpleasantness from life's menu of surprises, but folks I've talked to who have are unanimous that it's best avoided. Those who dropped dead right away were unavailable for comment. Convinced? Great! Not convinced?…please bear with me a little longer before skipping to the next chapter. Since exercise seems, on the face of it, so distasteful and the time devoted to it stolen, perforce, from other more pleasant activities, I've designed this exercise program around the following goals. Time spent doesn't increase as you progress. Easy to start, regardless of the shape you're in. No equipment needed. Exercise anywhere, in private if you like. The program is organised around a “fitness ladder” with 48 rungs. Each rung prescribes a given number of repetitions of five exercises. The first 15 rungs constitute the Introductory Ladder and involve easier variants of the exercises in the Lifetime Ladder, rungs 16 through 48. The exercises are intended to be done every day. Completing all the exercises typically takes between 10 and 15 minutes. Regardless of the shape you're in (or think you're in), start at the first rung of the Introductory Ladder and work your way up. The pace at which you climb the ladder depends on your own body. If you're in reasonable shape to start with, you may progress through the introductory rungs rapidly, then slow down as you reach the higher, more difficult levels. Just as it's important to start at rung 1, it's also important not to rush from rung to rung too quickly. Please spend at least five days on each rung as you advance; many people will prefer to spend at least a week per rung. When I was developing this plan, I used the following schedule, which I recommend. Run in place at a brisk pace for the specified number of steps, lifting your legs 4 to 6 inches from the floor with each step. Every 75 steps, stop and do 7 introductory “jumping jacks”: stand with your legs together, arms at your side. Jump up in the air, extending your legs to the side and your arms outward to the level of your shoulders. Then jump up again, bringing your legs back together and your arms back to your side. The “Count” column in the table helps you keep track of the running and jumping phases of this exercise. The first number is how many complete sets of 75 steps of running and 7 jumping jacks you should perform. The second number gives the number of extra steps you should run after the last full set (don't jump after these final steps). After you're comfortable with the exercises of rung 15, the top of the Introductory Ladder, you're ready to graduate to the Lifetime Ladder, rungs 16 and above, where you'll eventually find the level of fitness you're happy with. The entries for rungs in the Lifetime Ladder are interpreted exactly as those in the Introductory Ladder, but each specifies a somewhat more demanding exercise. Note, however, that the number of repetitions is reduced as you move from rung 15 to rung 16. This compensates for the increased difficulty of the exercises in the Lifetime Ladder and should make the transition no more difficult than between any two other rungs. The exercises in the Lifetime Ladder are sufficiently demanding that if you're seriously out of shape you may not be able to do a single one when you begin the exercise program at rung 1 of the Introductory Ladder. Don't worry; that's what the Introductory Ladder is all about. By the time you reach rung 16, you'll have the strength and stamina you need to take it in stride. Stand upright with your legs apart, hands outstretched above your head. Bend forward and touch the floor between your legs, bounce up a few inches, and touch the floor again. Then straighten up and bend backward. Repeat the specified number of times. Lie on your back on the floor, feet slightly apart, hands at your side. Lift your upper body, bending at the waist, until you're sitting up vertically. Keep your arms at your sides and your feet on the floor—avoid the temptation to “cheat” by pulling yourself up with your arms or levering yourself up by raising your legs. Smoothly lower your body back to the floor. Repeat the specified number of times. Lie face down on the floor, legs slightly apart, with the palms of your hands under your thighs. Lift both legs, bending at the hip, at least high enough that your thighs are lifted from your hands. Simultaneously lift your head and shoulders from the floor. Smoothly lower your head, shoulders, and both legs. Repeat the specified number of times. Lie face down on the floor with palms just outside your shoulders and arms bent. Keeping your back straight, pivoting on your toes, lift your body until your arms are straight. Then smoothly lower your body back to the floor, touching your chest. Repeat the specified number of times. Run in place at a brisk pace for the specified number of steps, lifting your legs 4 to 6 inches from the floor with each step. Every 75 steps, stop and do 10 “jumping jacks”: stand with your legs together, arms at your side. Jump up in the air, extending your legs to the side and your arms upward as high as you can (ideally touching your fingers together above your head, but at least above your shoulders). Then jump up again, bringing your legs back together and your arms back to your side. The “Count” column in the table makes it easier to keep track of the running and jumping phases of this exercise. The first number is how many complete sets of 75 steps of running and 10 jumping jacks you should perform. The second number gives the number of extra steps you should run after the last full set (don't jump after these final steps). Be sure to count a step in running only as your left foot touches the floor, not every time either foot touches. The easiest way to keep count is to repeatedly count to 75 as you run, do the ten jumps, then start counting from 1 again for the next running phase. I find that keeping count of the number of complete sets of running and jumping is best done by setting out a number of coins equal to the number of sets you're doing at the current rung and moving a coin from one pile to another after each set is completed. The Lifetime Ladder is called that because most people will find an optimal level of fitness on one of its rungs and maintain that level, more or less, for most of their subsequent years. The ideal level to attain depends on your age, your general state of health, and the characteristics of your own body. This isn't about training to become a professional athlete—it's a common sense program to maintain reasonable fitness in the interests of health and overall well-being. There's no reason to go off the deep end striving for levels above those you're happy with, and can sustain on a permanent basis. Almost all adults in good general health can reach and maintain rung 20 of the Lifetime Ladder, assuming they're not overweight or otherwise physically constrained. Most people below the age of 50 will have no trouble reaching rung 25. Beyond that, just continue to advance until you settle on a level you're happy with and can maintain every day. If, after a couple of months, the exercises at that rung begin to seem easier, your body's telling you its conditioning is continuing to improve. Try moving up to the next level and if it doesn't pose a problem, settle there. Gimme a couple of weeks. Very few people will start this program in worse shape than I was when I began to develop it. In only 90 days, I had reached rung 28, my initial goal, while managing to lose 20 pounds in the same period. Since then, I've slowly drifted upward, settling, after two and a half years, at rung 36. I'm happy there, although I may continue to creep upward over time. Almost anybody can have the same success with this exercise program or with any other sane program. There's nothing magical about any particular set of exercises or plan for doing them. Developing physical fitness through exercise is just like losing weight: extremely simple, but based on an unpleasant fact most people would rather ignore. For an exercise program to work, you have to follow it. All the exercise books in the world won't make you healthy as long as they're sitting on your shelf and you're sitting on your backside. This program is designed to motivate you to start it, progress through it, and keep it up for the rest of your life. Here's how. The first rung on the Introductory Ladder can be accomplished in a few minutes by almost anybody who's able to walk up a single flight of stairs without collapsing. In fact, it's so easy, why don't you try it right now? That wasn't so hard, was it? Oh, you didn't try it. Please, give it a shot. Now that you've tried that first rung today, go make a note of it in the “Rung” column of your weight log for today. Now that that column isn't blank, you'll feel better and better as you make each day's entry after completing the exercises. That's nothing compared to how you'll feel as you start to move up the rungs and you see the number climbing from week to week, month to month. The long-term rewards from exercise are longer life and better health: this program provides short-term feedback showing your progress as you persist in it (or lack of progress if you find too many excuses to skip the few minutes it takes, day after day). You exercise to build health, and when you're healthy you don't hurt and you aren't exhausted. The last thing you need is an exercise program that makes you feel awful. This program won't do that. You may ache a little after starting rung 1, but that should stop in a few days. After that, only move up to the next rung when you're comfortable at the current level however long that takes. If you advance to the next rung and find it's making you sore, or exhausted, or you have trouble completing the exercises in 15 minutes, no problem! Just drop back down to the previous rung, where you know you're already comfortable, and try the next level in another week or so. In all likelihood by then it won't present any problem. If it does, be patient; your body continues to gain strength and capacity even as you remain on a given rung. Further, the time required remains pretty much the same as you progress from rung to rung. Since each rung calls for more repetitions of each exercise this might not seem to make sense, but as your conditioning improves you'll find you're performing the exercises at a brisker pace, keeping the total time roughly constant. If one exercise seems to take forever to get through, that's an indication you've moved up to that rung too quickly. In exercise, as in controlling your weight, success is the very best motivator. Once you've followed this program through the Introductory Ladder onto the Lifetime Ladder, you will be able to look back on your early steps and find it hard to believe you ever could have found progressing up the lower rungs challenging at all. Progress in this program is so dramatic I recommend, on occasion, that you take the time to repeat the exercises for a rung five or ten below your current level. Remember when you found that hard? Can you imagine ever wanting to be that unfit again? Certainly not, especially since the time and effort to maintain your current rung are no more than you were spending to attain that much lower rung. Just as the feedback of the record sheet and charts is essential to controlling your weight, similar feedback can help you meet your fitness goals. The daily feedback in the exercise program is even more visceral than the number on a scale or a daily trend figure. It's how you feel after doing the exercises each day. If you progress up the rungs at the pace your body dictates, each day's exercise will leave you pleasantly invigorated. If you drop out of the program for a few days and try to jump back in at the same rung where you left it, you'll notice the difference—right away! Instead of a vague sense of your fitness and stamina slipping away, you'll see precisely how much you've lost by neglecting your body's need for exercise. Precisely, since after this happens and you drop back as many rungs as you need to resume the program without pain or exhaustion, your log will reflect the loss in fitness from neglecting daily exercise. As you note each day's level in the “Rung” field of the log sheet and enter those data into the spreadsheet every month, you're amassing a permanent record of your progress toward fitness. Just as the declining, then leveling out trend line on the weight chart shows your success in controlling your weight, the ascending exercise rung line documents, month after month, your climb toward and eventual maintenance of physical fitness. Looking back at your old charts and recalling the difference in how you felt then and now will make it easy to keep going. Unlike organised exercise programs or those requiring special equipment, you can begin this program at any time, practice it anywhere, and progress at your own pace without coercion or embarrassment. People who travel frequently usually find their exercise programs disrupted when they're on the road. After a two-week trip, they go back to the gym and are startled to discover how much they've slipped. Trying to catch up in a hurry leaves them sore the next day: hardly an incentive to go do it again! And before long the exercise program lies abandoned. With this program, that need never happen. All you need is yourself, fifteen minutes, and enough floor space to lie down. You can continue this exercise program in your hotel room, while visiting family, or wherever, and unless you wish to tell them, nobody need ever know. By exercising in private and keeping track of your own progress, you're assuming responsibility for your own health. If you undertake an exercise program for any other reason, you're likely to fail. As you advance through this program, you'll see your progress and take pride in it. If you put it aside for a time, you'll see the price you're paying reflected right in the numbers, and you can make your own decision about just how much time is worth devoting to better health and longer life. As you progress in this exercise program, you'll undoubtedly encounter numerous special situations that affect your progress. I'll try to discuss some of the most common, based on my own experience. If you want to make an exercise program a regular part of your life, it's best to assign it a particular time in the day and become accustomed to exercising then. If you're always used, for example, to doing your exercises right before hopping in the shower, it will increase the sense that something's wrong if you should skip them one day. Certainly anybody with a harried schedule will have to improvise from time to time, and that's OK; it's far better to work an exercise session in at a weird time than skip it. But from day to day, try to find a time that fits your schedule and stick to it. When you come down with a cold or 'flu, you may be sufficiently wiped out that the very thought of exercising makes you shudder even worse. That's fine; exercising is about being healthy. The last thing you want to do is associate exercising with feeling even more awful than you already do after being trampled by a rhinovirus. Put the program on hold until you're on the mend and feel up to resuming it. When you do start exercising again, you may be in for a surprise. If you stop exercising for four or five days, it's normal to have to drop back one rung and work back up. After a week of illness, you may have to drop three rungs or even more. People talk about a cold “taking something out of you.” With the feedback this program provides, you'll see it right in the numbers. What's more, you'll know when your recovery is complete, since that's when you'll return to the rung you'd attained before falling ill. If you're seriously sick: typhoid, plague, creeping body rot, rely on the guidance of your doctor about exercise. The marvelous mechanism that is your body has many signals to let you know when problems arise. If you're exercising and you encounter chest pains, shortness of breath, or other indications that something is awry inside your rib cage, don't ignore them! Please, if any of these symptoms arise, stop exercising, consult a doctor, and resume the program only under the guidance of a medical professional. Physicians can wire you up and run a comprehensive set of diagnostics to find out whether something is seriously wrong or you're just trying to push your body beyond its natural limits. Ignoring these signals from your body is the height of folly. It can lead to all kinds of tedious and exasperating side effects such as sudden death. This exercise program is intended to help you reach and maintain a reasonable level of physical fitness. It's safe to say that once you're doing the exercises above rung 20, you're in far better shape than most of the people you pass on the street. If you're inclined to participate in active sports, work out with weights, or engage in other forms of exercise, great! With this program as a foundation, you can extend your fitness in any number of ways. If you have the time, and you enjoy it, it'll only make you healthier and happier. I'd recommend, however, that unless you participate on an absolutely regular schedule, you look on those forms of training as supplemental to the basic level of fitness maintenance provided by this program. If, nevertheless, you're inclined to say, “One hour at the gym is worth a day's exercise on the Lifetime Ladder” it's easy to see if that's true. If you find it hard to maintain your current rung, or to progress at the rate you wish, then the other exercise isn't adequately replacing the balanced set of exercises this program provides. Feedback doesn't lie. The weight log spreadsheet contains a feature to help you keep track of other exercise programs. If you participate, whether regularly or sporadically, in such a program, put a check mark after the “Rung” column on your log sheet every day you do the other exercise. Record these check marks in the “Flag” field of the weight log worksheet by entering the number 1 in the Flag cells for the days you checked on your log sheet. The monthly log will display, at the foot of the Flag field, the percentage of days that month you performed the other exercise. This can give you a feel for how significant that activity is with regard to your weight or your progress up the Lifetime Ladder. The monthly logs, kept in your log book, will show your participation, which you can review as you evaluate your weight and health progress. I use the Flag field to keep track of a weightlifting program with which I supplement my regular exercise. Every day I work out with weights, I check the flag field; at the end of the month I can see how frequently I got around to it. You can use the flag field to keep track of any event you'd like to track in connection with your weight and health, for example, every time you go out for pizza with the gang at lunchtime, or swim the Hellespont in lieu of dinner.